If you are looking for the best holiday deal or about to book a self catering break then take a look at some of the latest great deals. 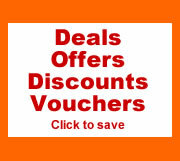 Sign up to our newsletter to be kept in touch with other great offers and deals. Terms & conditions apply, see website. Beach Hut Studio is a Marketing Consultancy and Website Design Business based in Shoreham by Sea, West Sussex. Beach Hut Studio is the trading name of Beach Hut Studio Limited. Beach Hut Studio is registered in England, no 7076935. Beach Hut Studio is based in Shoreham by Sea, West Sussex, England. Contact Beach Hut Studio. Holiday and Travel. Featured Holiday Information. See terms and conditions, privacy and sitemap.